WHY would I put balls in my dryer? you might ask. To reduce drying time, conserve energy and save money, would be my answer. How does this work? You might ask. By keeping clothing from clumping. Other benefits include reducing wrinkles and static. What kind of balls do you recommend, Lori? you might ask. 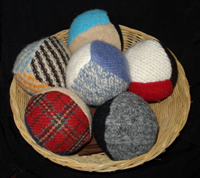 EcoSisters Recycled Wool Dryer Balls. The raw materials come from recycled wool garments (the wool is a renewable resource) and save said garments from ending up in a landfill. Double punch in favor of the environment. But Lori, you might point out, these are $20 a pair. Why not just get the cheap plastic ones in the AsSeenOnTV aisle at the drugstore? Because you also care about the environment of your home, I'd say. You don't want heated plastic toxins permeating your clothing and being released into your home. EcoSisters sent me a set of dryer balls to try out. In my unscientific studies, using a pair saved about 15% in drying time. Use of the dryer balls reduced static so that fabric softener become less necessary. The dryer balls are reusable and I'm betting will last many years. EcoSisters suggest that you may even want to throw in 4 or 6 balls in for larger loads. My only complaint, a small one, is the extra time it takes to find each ball when I move the clothes from the dryer to the laundry basket. But it does give me an legitimate excuse to yell, "Balls!" How often does that happen? I have been releasing plastic toxins into my clothing for a while and wondering what was a better alternative. Yeah, gonna get me some of these - thanks.